With major funding cutbacks affecting Texas schools, the Houston Chamber Choir is committed to countering the drastic loss of arts education with targeted, educational outreach experiences. Partnering with Houston Independent School District, Houston Chamber Choir's innovative education program, Rise Up Singing!, launched in 2012, introduces students to classic American folksongs by bringing vocal instruction, ear training, and music history to students in Houston's most economically disadvantaged elementary schools that currently do not have music programs. 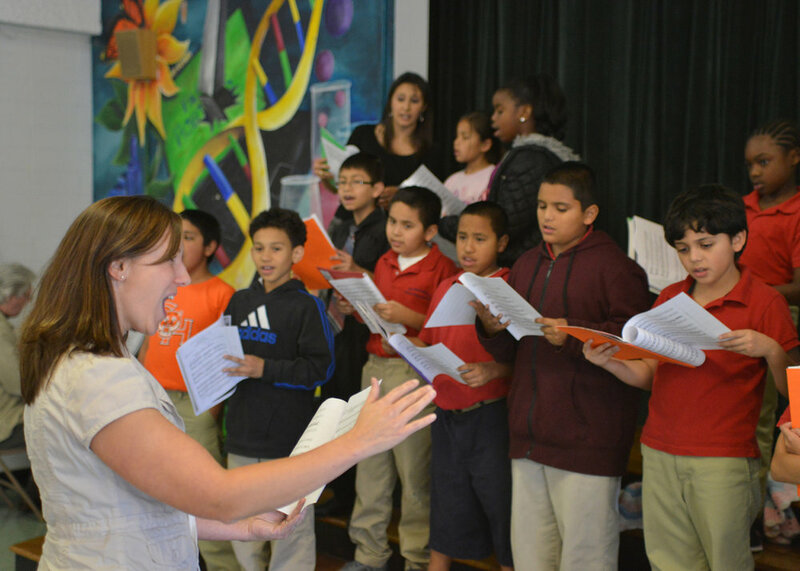 Thanks to the support of the National Endowment for the Arts, the Houston Chamber Choir began its program at the Rusk School in East Houston. After three years of residency there, the principal saw the benefits to having a full time music program at the school and hired a music teacher in 2015, leaving Houston Chamber Choir to expand outreach programming to other schools, one of them being Davila Elementary School. Our program caught the attention of the HISD East Area Schools Office’s Fine Arts Specialist in 2017. We had the privilege of working with Rucker Elementary School in the fall of the 2017-2018 academic year, teaching all 2-3 graders for a full 45-minute period during the day, as well an after school choral program for their 4-5 graders. This allowed the Houston Chamber Choir to see nearly 300 children a week at Rucker alone. In order for the Houston Chamber Choir to continue to offer educational outreach opportunities through Rise Up Singing! we need your support. Help us continue to provide exceptional music education and outreach to Houston's youth by making a contribution today. Thank you from the bottom of my heart. You have changed the way I view music in schools and changed the lives of these children. Not only will you always hold a special place in the heart of the children you have inspired, but also mine.